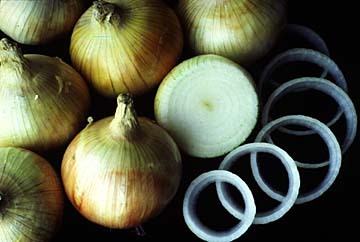 There are usually two ways to successfully grow those jumbo stinkers called onions . Seed can be planted in October or transplants can be planted now. Onion seedlings which are small and rapidly growing often don't survive when the cold temperatures occur. This means that most onions will HAVE to be grown from transplants. For best results and maximum sized onion bulbs, certain procedures should be followed. Fertilization of onion transplants is vital to success. Texas A&M research findings indicate that onion growth and yield can be greatly enhanced by banding phosphorus 2-3 inches below transplants at planting time. This phosphorus acts as a starter solution which invigorates their growth. Banding phosphorus, such as super phosphate (0-20-0), 2-3 inches below the plant involves making a trench or planting furrow 4 inches deep in the raised planting bed, distributing one-half cup (one-half pound) of super phosphate per 10 linear feet of row, covering the phosphate with 2 inches of soil, and planting transplants. 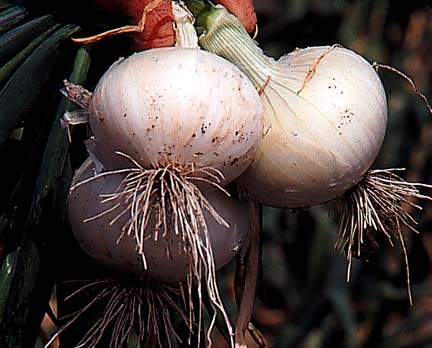 Once established, onion plants should receive additional amounts of fertilizer such as ammonium sulfate (21-0-0) as a sidedress application EVERY three weeks -- use one cupful or one pound per 100 square feet (10' X 10') of planting area. 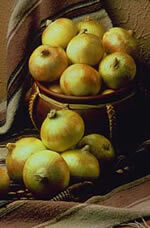 Remember that onions require several months to mature so plant them in a location which won't be needed until June. 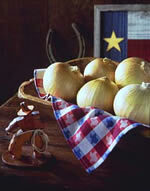 Also, don't plant onions where they may be shaded later by larger growing plants such as tomatoes or corn. Shading decreases growth rate and, subsequently, bulb size. I have been told that "you can't make a silk purse out of a sow's ear". Since sow's ears are in short supply, I have never tried the silk purse conversion but I DO know that the onion transplant you use will largely determine the bulbing success. A quality transplant must be used. Unfortunately, in the past, many of the onion plants sold were diseased with pink root fungus, misnamed and of poor quality. Texas Cooperative Extension horticulturists have identified sources of true-to-name, disease-free, field-grown transplants which are now available in local nurseries. For optimum bulb size, onion plants must be planted as soon as possible and judiciously fertilized throughout the season as outlined above. When selecting onion plants, the largest transplant may not be the best. If the stem of onion plants are larger than a pencil when exposed to cold temperatures, the onion will initiate and produce a flower. This flowering is termed as bolting. Most rapid bolting is caused by temperatures of 40-45 degrees F. or below. Fall seeded onion transplants are prone to bolting this spring if onions with stems larger than a pencil were exposed to warm fall temperatures, allowing excessive growth, followed by low winter temperatures and slowed growth. Many gardeners believe that early removal of the onion flower stalk will cause onion bulb enlargement but this has not proven to be the case. Flowering causes a decrease in bulb size as well as a central flower stalk which enhances decay during storage. The onion bulbs which produce a flower stalk may be large but they will be light-weight (one-half the weight of a comparable size, non-flowered onion bulb) and prone to decay. So give your neighbor "friends" the large onion transplants --you keep and plant the less-than-pencil-size transplants which can't bolt.